This tour is a "deluxe" version of the East Arm tour. 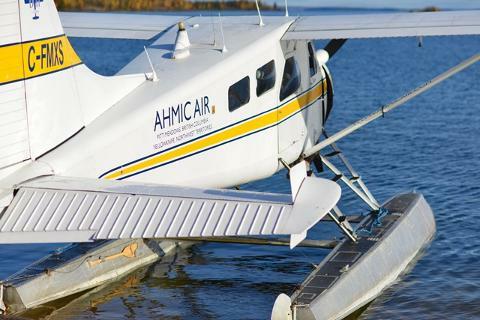 Your flight will leave Yellowknife following the shoreline out Yellowknife Bay and the same flight path as our East Arm tour providing you ample opportunity to take in all of the splendor of Great Slave Lake's East Arm; a world class scenic and geological wonder. We will continue down the east arm to the easterly limits of Great Slave Lake taking you past McLeod Bay and to Charlton Bay and the start of Pike’s Portage. Pike's Portage is an ancient travel route between Great Slave Lake and the Barren Lands. Referred to by many as the highway to the Barrens. The route was named outdoor enthusiasts for Warburton Pike who documented the route during his 1889-1890 exploration of the area. The route is 40km (25 sm) long and follows a chain of lakes that lead around the Lockhart River (Tyrrell Falls 26m (85'), Parry Falls 40m (131'), Andersen Falls 22 m (75')) from Great Slave Lake to the tree line at Artillery Lake. The route ascends 305m (1000') over 40km (25 sm). We will fly over Pike's Portage to Artillery Lake where you will see the tree line and get a glimpse of the Barren Lands and tundra landscape in the distance. From Artillery Lake we will follow the Lockhart River back to Great Slave Lake flying over the three sets of falls. If you would like to hike into see Thakui T'seda - "The Old Lady of The Falls". We will stop at a nearby lake from which it is an easy 45-60 minute hike each way, on a well-marked trail. "The Old Lady of The Falls" – is a spiritual place to the Lutselk'e Dene. The base of the Falls is shaped like a bowl where the power of the falls make the water bubble and foam as if it were boiling. Legend says that Old Lady is a medicine woman and that she sits in a cave behind the falls. People from all over come and pay their respects to her. There is no other place like it in the Northwest Territories. At the outflow of the Lockhart River into Great Slave Lake is the site of Old Fort Reliance on Great Slave Lake where you will have the option to examine the "Back Chimneys" historical site if you wish. The chimneys are the remains of the wintering fort built in the late 19th century. This charter flight permits for up to 4-1/2 hours of combined time at the various sites on the ground you wish to visit. There are some sites mentioned you may simply wish to fly over rather than visit by foot. Please remember this is a private charter for you and your friends and family. If you see something along the way that you would like to stop and investigate further or simply wish to get out and stretch your legs please let your pilot know. As long as it is safe to do so your pilot will land and beach the aircraft where you direct. You may find yourself a little fishing hole or picnic site you simply don’t wish to leave right away. On our way back to Yellowknife we will fly a more direct route once past Christie Bay. 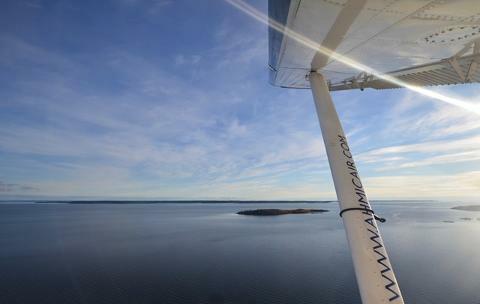 You will see first hand the endless number of lakes in the region north of Great Slave Lake. As with our other tours you will get to experience flight on one of our iconic de Havilland Canada DHC-2 Beaver Aircraft not only providing you with a raven's eye view of region but also providing you with the experience of taking a step back in time and enjoying a flight on-board a classic aircraft. Our Beaver aircraft feature comfortable interiors, enlarged windows for easy viewing and aviation headsets for all guests to provide easy communication between guests and the pilot. Each guest is will be seated at a window seat. Our pilots are very proud of their aircraft, their profession and the region they fly throughout. We encourage our guests to ask as many questions as they wish throughout each tour. Our pilots will be more than happy to answer all of your questions about their craft and the region they call home. Approximately 8-9 hours depending on time spent at falls and or any other stops requested. -Personal beverages & lunch if you wish (see catered lunch option). Fishing equipment is provided only as a guest convenience and is to be used by guests in self-guided manner as we do not offer fish guiding services nor are we registered as fishing guides with the NWT or NU governments. -Purchase Ahmic Air Souvenirs such as T-shirts, Polos and hats. Extras may be purchased at checkout, by selecting the next level of tour, or by calling (emailing) Ahmic Air. 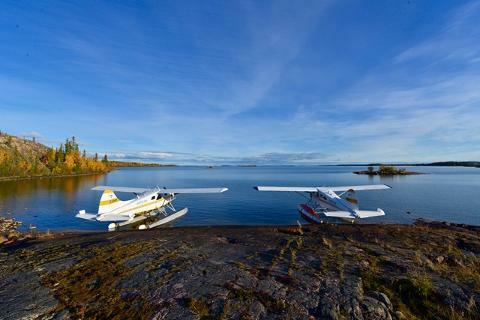 We operate our Yellowknife, NWT Beaver floatplanes tours from our dock located on Yellowknife's Back Bay across the street from Bullock's Bistro and beside Weaver and Devore Trading Ltd.. If you are traveling by taxi ask to be delivered to Weave & Devore Trading and this will put you within foot steps of our dock. Please arrive at our dock in time to check in 15 minutes prior to the flight time you have booked. When booking online, payments to Ahmic Air may be made through Visa, MasterCard or the Paypal gateway. Our online booking policy for tour products based from Yellowknife, NT is to collect the entire charter fee at the time of booking. All fees are in Canadian dollars and all advertised prices are inclusive of all service charges, fees, and the 5% Goods and Services Tax (GST). When the cancellation is made more than 30 days prior to the planned departure, no cancellation charges shall be levied and any booking fees received will be returned. When the cancellation is made 30 days or less prior to, and more than 5 days prior to the planned departure, booking fees received may be applied to flights booked to depart within 30 days of the original booked departure date; otherwise 25 % of the total air transportation contract price will be retained by the carrier as a cancellation charge. When the cancellation is made less than 5 days prior to the planned departure of the flight, 25 % of the total air transportation contract price will be retained by the carrier as a cancellation charge. In situations where Ahmic Air must cancel a tour due to weather or other unforeseen circumstances the customer will be provided with a full refund of all booking fees collected or if they wish, the opportunity to reschedule and apply their refund to a new booking. This trip may be purchased as a gift and a Gift Certificate will be mailed to the shipping address provided. When booking online as a gift, payments to Ahmic Air may be made through Visa, MasterCard or the Paypal gateway. Our online booking policy for tour products based from Yellowknife, NT is to collect the entire charter fee at the time of booking. All fees are in Canadian dollars and all advertised prices are inclusive of all service charges, fees, and the 5% Goods and Services Tax (GST). Tours purchased as a gift expire 1 year from the date of purchase and are non-refundable. Gift purchases may be applied towards other tours or charters of the same or greater value within one year of the purchase date. To best serve the recipient of the Gift Certificate by providing their first choice of travel dates and times we advise the recipient to book their flight times with us as soon as possible as aircraft bookings are assigned on a first come, first served basis.